Are you ready a fun weekend of Halloween festivities? The spooktacular crew over at Green Halloween® has tons of tips to help ensure you have a safe night that’s also easy on the planet. And once your tot is all dressed up in her homemade or eco-friendly Halloween costume, don’t forget to take lots of pictures (as if we have to remind you! 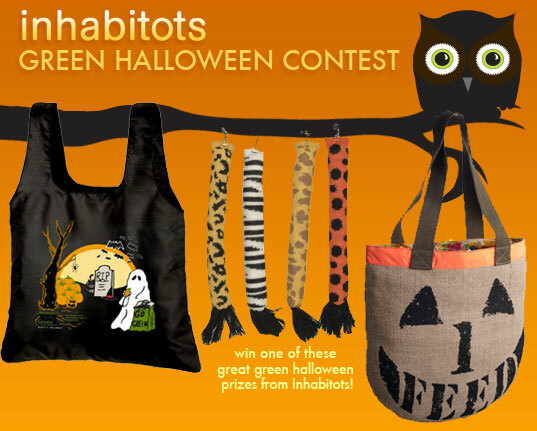 ), and then be sure to enter our Inhabitots Green Halloween® Costume Contest by uploading your photos to our site. This year’s prizes include an Oeuf Mask & Tail set, Yummy Earth lollipops, FEED Trick-or-Treat Bags to Benefit UNICEF, eco-friendly Halloween bags from ChicoBag, and Inhabischwag. What are you waiting for? Show us your amazing creativity and costume-making ability now! Are you ready a fun weekend of Halloween festivities? The spooktacular crew over at Green Halloween� has tons of tips to help ensure you have a safe night that's also easy on the planet. And once your tot is all dressed up in her homemade or eco-friendly Halloween costume, don't forget to take lots of pictures (as if we have to remind you! ), and then be sure to enter our Inhabitots Green Halloween� Costume Contest by uploading your photos to our site. This year's prizes include an Oeuf Mask & Tail set, Yummy Earth lollipops, FEED Trick-or-Treat Bags to Benefit UNICEF, eco-friendly Halloween bags from ChicoBag, and Inhabischwag. What are you waiting for? Show us your amazing creativity and costume-making ability now!